Four goals in the final quarter gave the Rooks a good return from a local derby on a baking hot afternoon in the beautiful surroundings at Saltdean United. 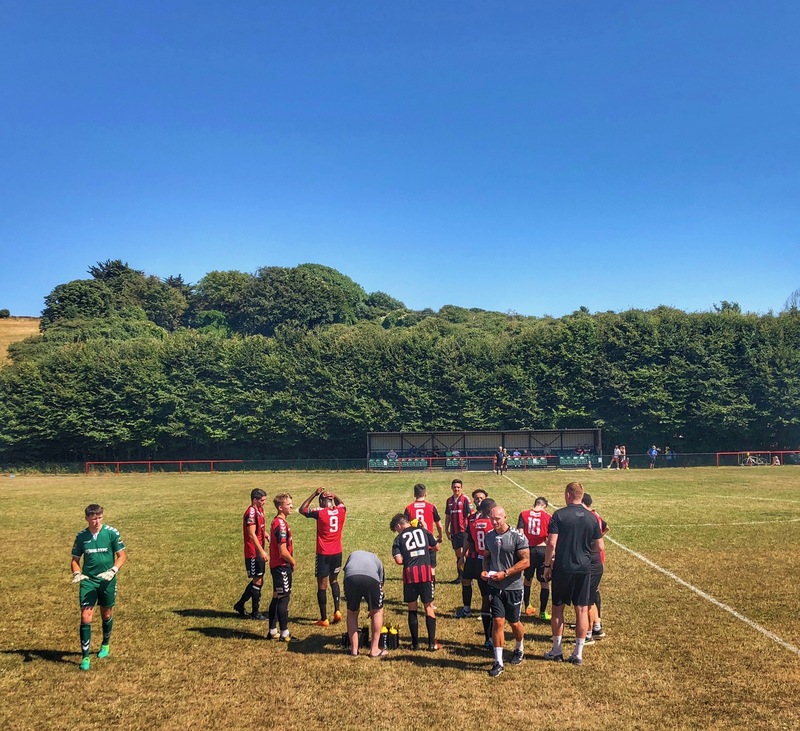 Four second-half goals saw Lewes continue their winning start to pre-season with a convincing win at Southern Combination League side Saltdean United, reports Tom Harper. The only action of note during the opening stages of an uneventful first half saw Jack Walder, making his first appearance after returning to the Rooks from Crowborough Athletic during the summer, forced off injured after an innocuous-looking challenge on former Lewes player Jamie Brotherton. The only half-chances of the first half fell to the Rooks, who saw both Dylan Gifford and Nico Cotton narrowly miss the target from distance and Marcus Elliott have a shot from just inside the area deflected wide. As at Lancing on Tuesday night, Darren Freeman made several changes at half-time and Lewes immediately began to create more clear-cut opportunities due to their pace and movement in the final third. The Rooks hit the woodwork twice within minutes of the restart, with Ronnie Conlon seeing a curling strike hit the underside of the bar after good play down the right from Luke Blewden, before Nassim Dukali saw an in-swinging corner from the left missed by the Saltdean goalkeeper and hit the inside of the far post before eventually being scrambled clear. Lewes took the lead just after the drinks break midway through the second half, as Conlon collected a short corner from Dukali and beat his man before cutting the ball back for Jonte Smith to finish from close range. The hosts were finding it difficult to create any chances of note but came close to equalising within minutes of falling behind, with Harry Reed forced into an excellent goal-line clearance to keep out an effort from a tight angle. The Rooks started to show more quality on the ball in the closing stages on a very dry surface that made incisive passing difficult and doubled their lead with just under ten minutes remaining through Blewden, who scored from close-range after the Saltdean goalkeeper had done well to keep out Smith’s initial effort. Lewes goalkeeper Nathan Stroomberg was called into his first meaningful action of the game with five minutes remaining to keep out a powerful strike from the edge of the area. With Harrison Parker forced off injured with minutes remaining, Freeman elected to play the final few minutes with just ten men to give the players experience of different scenarios ahead of the league season starting next month. This failed to prevent the Rooks controlling the remainder of the game and scoring a third goal with just three minutes remaining, as Blewden latched onto an attempted chest back to the goalkeeper to finish from inside the six-yard box. Lewes added a fourth goal a minute later through Dukali, who took a touch before sending a powerful half-volley past the goalkeeper and into corner after Ross Barclay had seen his initial effort blocked. The Rooks continue their preparations for the new season with a trip to Hastings United on Tuesday 24th July, kick-off at 7.45pm. Lewes first half: Stroomberg, Reed, Redwood, Chappell, Malins, Cotton, Lawson, Elliott, Coppola, Walder (Barclay), Gifford. Lewes second half: Stroomberg, Brinkhurst, Headland, Malins (Reed), Parker, Hammond, Barclay, Blewden, Dukali, Conlon, Smith.